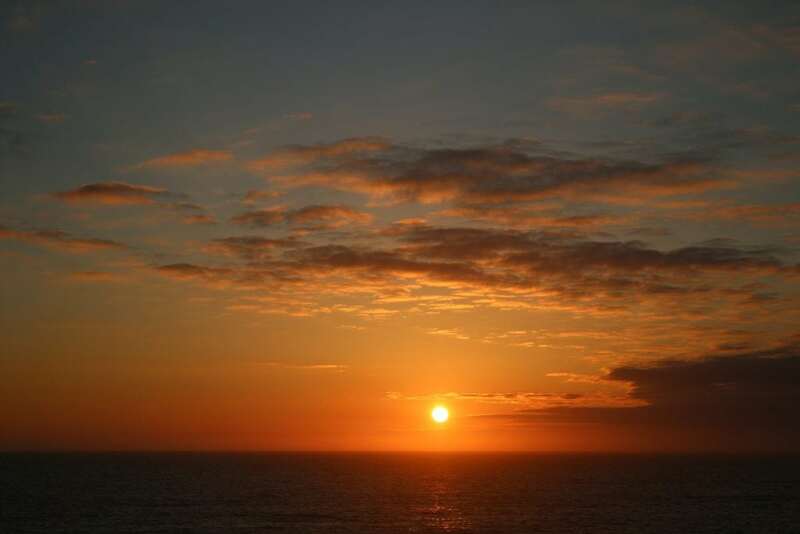 In our opinion, there’s nothing better than spending an evening watching the sun going down over the sea. Imagine sitting at a beach bar, sipping on a pint with a spectacular sunset view. Or snuggling up under a blanket on the clifftop or around the campfire with a hot chocolate, watching the sun go down. 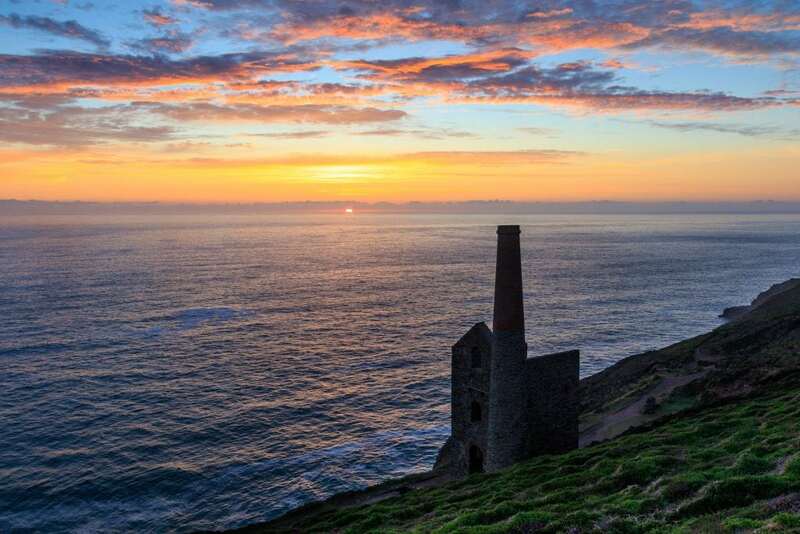 We’re spoilt for choice with beautiful sunset spots in Cornwall, but we’ve picked ten of our favourites for you to enjoy. Fistral beach is one of the best places in Cornwall to go for a surf. 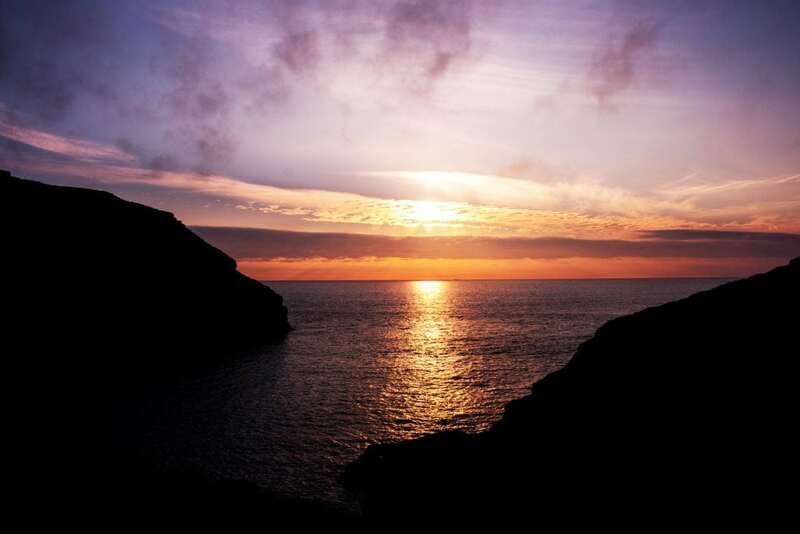 It is also one of the best sunset spots in Cornwall. Watch the sun go down over the Atlantic Ocean with a cold pint from The Stable restaurant, or go for a romantic beach stroll along the water’s edge, watching the red, orange and yellow sun shimmering on the water. 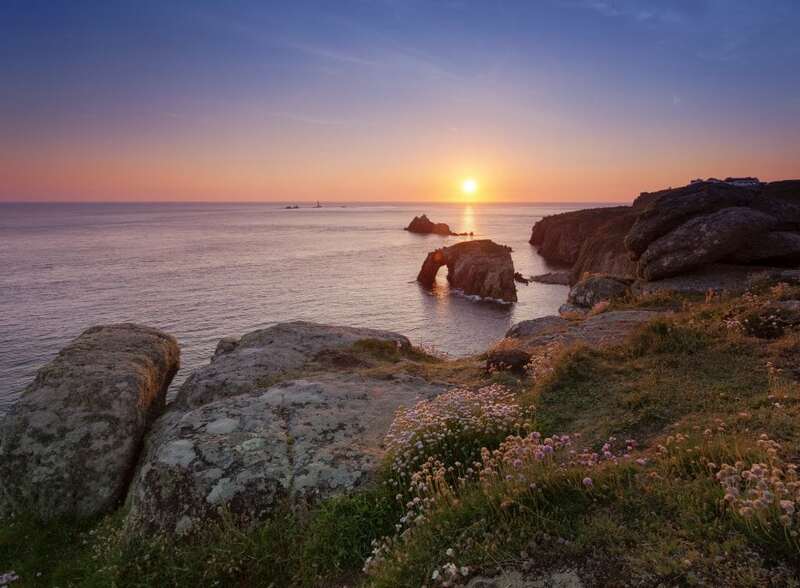 Go to the most westerly part of mainland Cornwall and of the UK to watch a mesmerising sunset over Land’s End. The rugged granite cliffs tower over the ocean below, creating a unique setting and a dramatic sunset. The sunset lighting up the vast sea and sky on the edge of the land makes it feel like the sun is dropping off the edge of the earth! The Godrevy to Portreath Area of Outstanding Natural Beauty has some amazing coastal walks and stunning sea views. 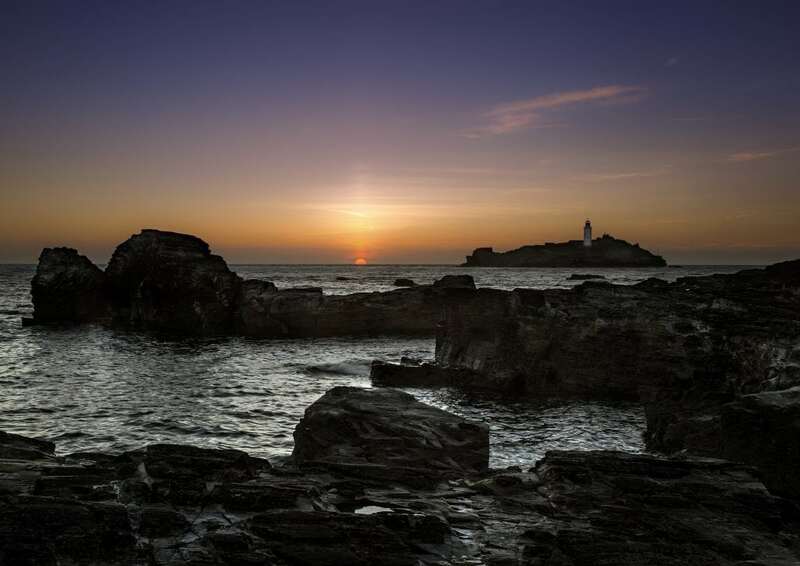 The lighthouse across from Goodrevy beach creates one of the most dazzling sunset spots in Cornwall. Take a warm jumper and a flask of coffee or can of beer and enjoy the spectacular show from the clifftop. Bude in North Cornwall is a beautiful seaside town, facing the full force of the Atlantic ocean. It can be stormy in the winter and is full of surfers in the summer. Sandymouth beach connects to the main beach at Bude when the tide is low and is a lovely little spot to skim stones and watch the sun go down over the sea. 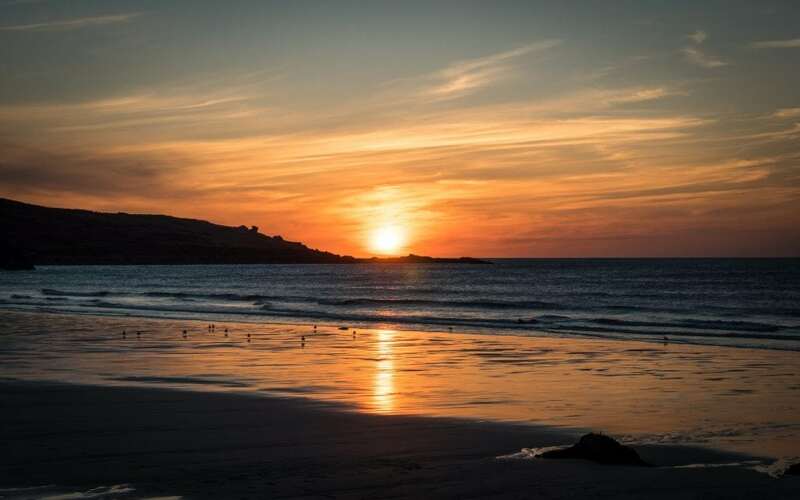 Enjoy a drink in one of the heated booths at Porthmeor Cafe whilst being treated to a gorgeous sunset. Porthmeor is a popular surfing beach so you’ll usually find surfers chilling out at the cafe in the evening. It’s a buzzing yet relaxed environment. Before the light fades, you may even be lucky enough to spot dolphins in the water. If you’re staying in the area, you can watch the sunset from your St Ives Cottage. This striking sunset never disappoints. Tintagel is steeped in history, myths and mystery. One of the caves on the beach was rumoured to be the home of Merlin, the castle was said to be the birthplace of King Arthur and it also has links to Cornwall’s smuggling past. Some say the castle is haunted and the clifftop is certainly an atmospheric place to sit and enjoy one of the best sunset spots in Cornwall. For an impressive display of light behind a floating castle in the sea, St Michael’s Mount is the place to be. 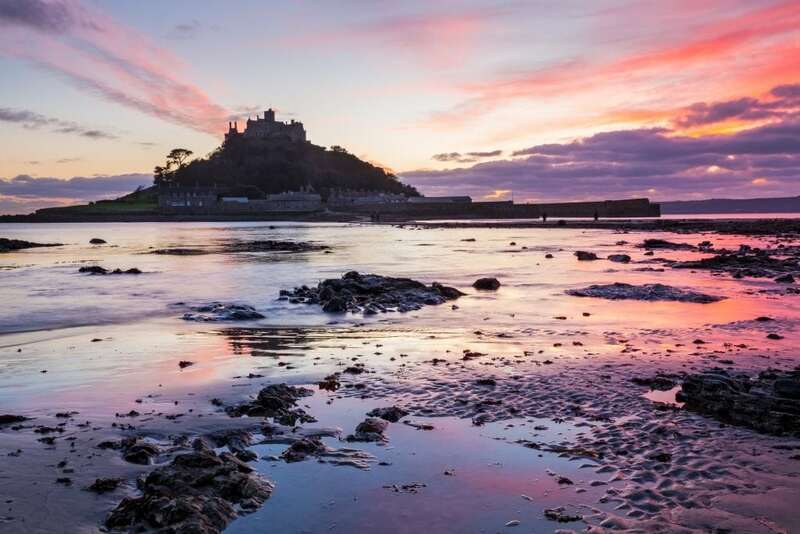 Take a picnic blanket to Marazion beach for the perfect view of this pretty sunset in West Cornwall. If you’re more adventurous, you could hire a kayak or stand up paddle board and paddle your way around the mount to enjoy the view! 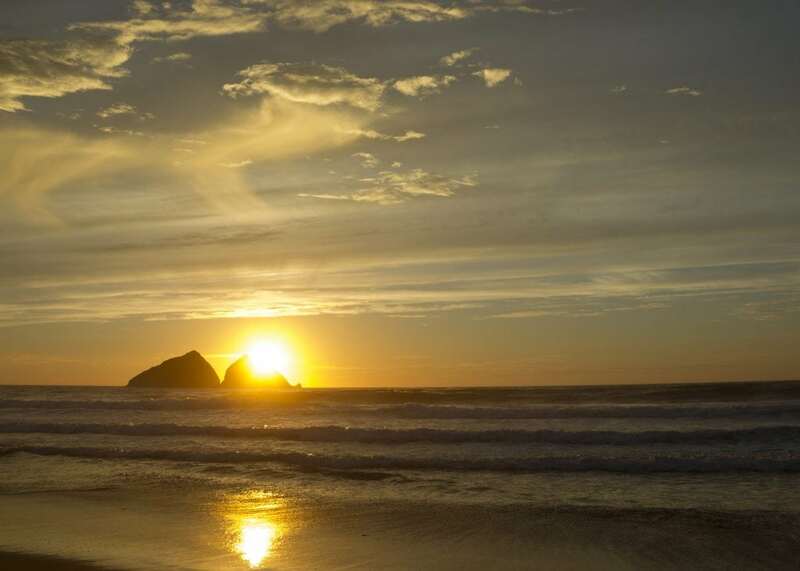 The breathtaking scenery at Bedruthan Steps creates the perfect backdrop for the sunset. Watch from an elevated clifftop position or from down on the beach. Bedruthan is accessed from steep steps on the cliff-side, so do take care when you’re walking there and back. 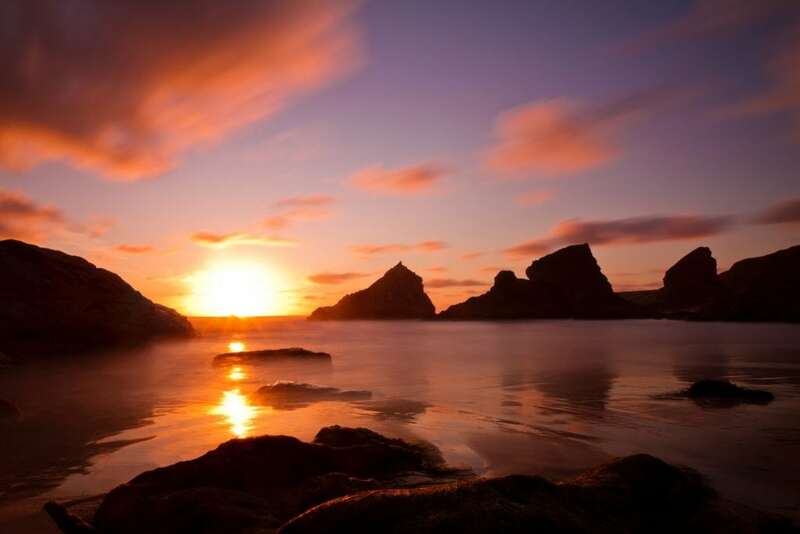 According to the legend, the magnificent rocks were the stepping stones for Bedruthan the giant. They certainly are impressive! Any keen Poldark fans will have spotted this view in many of the episodes, as it provides the setting for the Warleggan family’s beach. 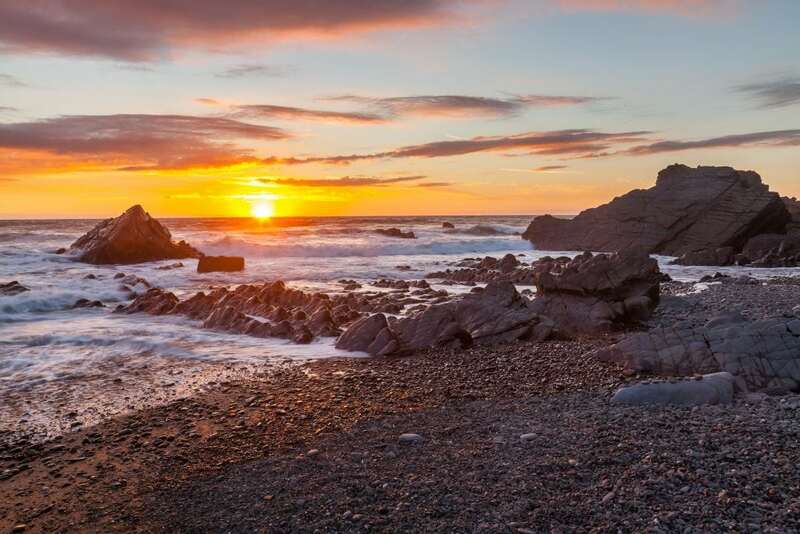 The rocks in the sea known as Gull Rock are easily recognisable and provide a magical sunset setting. Holywell Bay is a lovely beach for an evening surf or a couple of drinks and a BBQ with friends. The Wheal Coates mine opened in 1802 and was a working mine until 1889. The structure is still standing and is a reminder of Cornwall’s mining heritage. It also provides a dramatic setting for sunset watching. Situated close to Chapel Porth beach near St Agnes, it can be accessed by the south west coast path. Watch the sun go down whilst listening to the gentle roar of the ocean. Watching a sunset in Cornwall is a mesmerising experience, no matter what time of year it is. If you’re planning a romantic break or a relaxing getaway with family or friends, take a look at our selection of St Ives apartments, coastal cottages and holiday homes.